A large fire involving a lorry closed part of the M1 in Northamptonshire for around 19 hours. 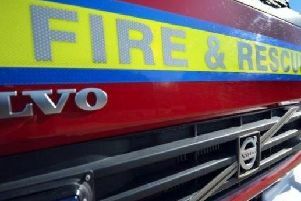 Northamptonshire Fire and Rescue Service was called to the M1 southbound at junction 18 for Crick at around 9pm last night (Monday) where a lorry carrying cheese had caught fire. Firefighters tackled the blaze for several hours and emergency services were forced to close the road, causing severe delays. Photographer Max Earey was caught up in the delays and photographed the blaze. In the main picture a firefighter can be seen to the right, laying low to tackle the flames. The carriageway reopened just before 3.30pm this afternoon. There are still long delays of around 90 minutes.